Detailed below are the complete parts lists for the BAYKO Retail Packs from the Plimpton era - they were actually known, as you can see from the picture [below left & right], as 'BAYKO Accessory Packs'. 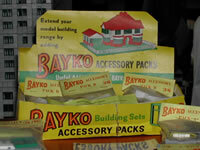 These 3 BAYKO retail packs [left, below] were produced by Plimpton Engineering for just 2 years, between 1958 and 1959. Pack A was priced at 2 shillings. [= 10p, 12.8 cents US, 11.3 Euro cents]. Pack B was priced at 3s. 6d. [=17.5p, 22.4 cents US, 19.8 Euro cents]. Pack C was priced at 5s. 6d. [=27.5p, 35.2 cents US, 31.1 Euro cents]. The $ and € exchange rates used [above] were last updated on December 1st, 2018. As can be seen [right, above] they were to be displayed for sale in the printed cardboard cartons in which they were shipped to the retailer. Based on the carton I own [I know of no other] there are no external markings distinguishing the contents - where they wrapped, and the wrapping labelled? …please click here to tell me your information. …costing the retailer 13/4 [66.5p], 15/7 [78p] and 18/4 [91.5p] respectively from April 8th, 1959. This means that all three Packs A, B and C yield a gross profit of 80%. …clear evidence that the Crazy Paving moulding was changed some time in the mid 1950s. Click on any of the highlighted pack letters below [e.g. B] to see a photo of the pack. Click on any of the highlighted pack letters above [e.g. B] to see a photo of the pack. …it was included in the display pack shown top right.